From financial institutions to factories, video surveillance is common in many workplaces. It is especially prevalent in places where there is inventory or cash. Deterring harassment, theft and vandalism are just some of the reasons an employer may want to monitor their employees. However, the Canadian justice system has not been particularly tolerant toward employers who video monitor their employees without good faith or cause. In Canada, employees have a general right to privacy at the workplace, like in any other public space, unless it is explicitly stated otherwise in their employment contract. Accordingly, an employee would not have a reasonable expectation of privacy in an open lobby but would in a locker room. Well defined workplace policies should be your first defence against employee misconduct. Video surveillance in the workplace should be the option of last resort. 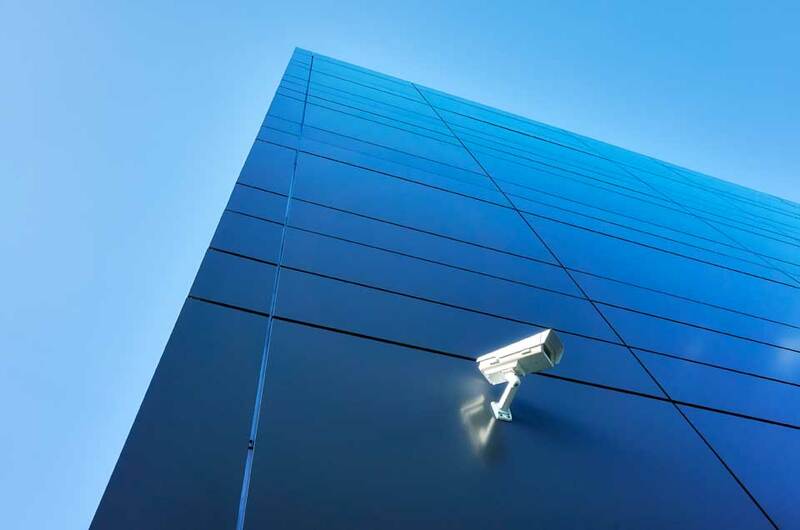 Less invasive means of monitoring issues of suspected criminal activity, harassment, or violence should also be pursued before installing cameras. Only once other options for deterring suspected or known inappropriate behaviour have been exhausted should video surveillance be considered. Is Video Surveillance In A Workplace Legal? There must be a legitimate concern that an offence is being committed and that installing cameras will be an effective approach to solving this problem. Except for rare circumstances, it is necessary to alert employees to surveillance practices and obtain their consent. Individuals should be able to know who is watching what and to what end. Surveillance should monitor a particular area suspected of improper activity and for a determined period of time. However, surveillance must not single out a specific employee. The expanse of surveillance should be limited as much as possible. General surveillance for an indefinite time is usually considered unacceptable. Surveillance should be conducted with a specific purpose and only used for said purpose. 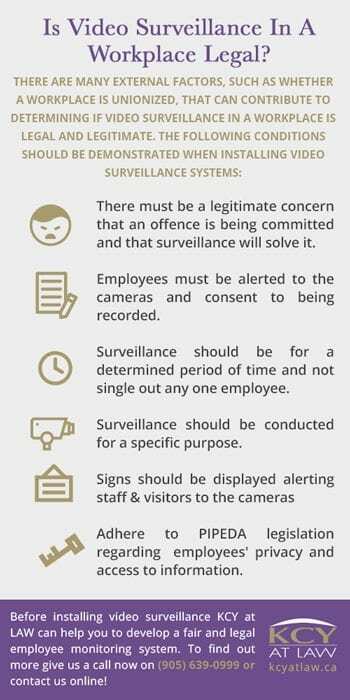 Signs alerting employees and visitors to surveillance cameras should be prominently displayed. Adhere to PIPEDA legislation regarding employees’ privacy and access to information. To avoid infringing upon your employee’s privacy rights, you should talk to an experienced employment lawyer before installing any surveillance measures in the workplace. KCY at LAW can help you to develop fair and legal employee monitoring systems. To find out more give us a call now on (905) 639-0999 or contact us online! 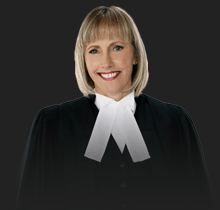 https://www.kcyatlaw.ca/wp-content/uploads/2017/01/Video-Surveillance-in-the-Workplace.jpg 636 960 Kathy Chittley-Young https://www.kcyatlaw.ca/wp-content/uploads/2018/01/KCY-at-LAW.svg Kathy Chittley-Young2017-01-25 17:52:182019-03-08 17:29:55Video Surveillance in the Workplace - Big Brother Boss?